You should've seen the look on his face. He turned around and went back over to the crib and she said it again! Talk about being on Cloud 9. I'm surprised he was able to tear himself away and leave for work. My mom warned me this may happen. "Babies can make the 'D' sound sooner than they can make the 'M' sound..." she said. But something tells me even if she could make the "M" sound, this morning would have transpired the same nonetheless. 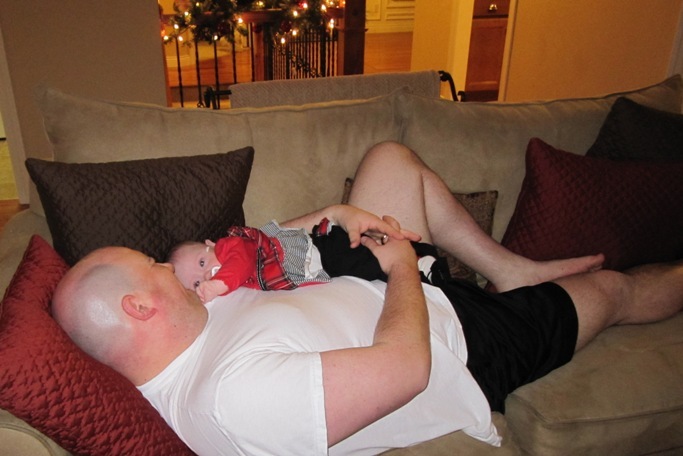 Because there's something about a little girl and her "Da Da". 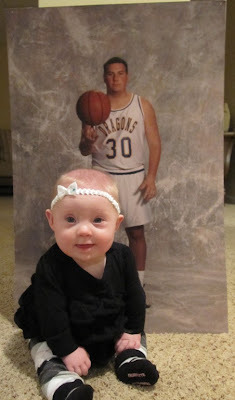 Josie proudly posed next to a poster-sized photo of her "Da Da" as a high school basketball star. He always likes to point out that he had plenty of hair - until he met me. LOVE that last photo...She's SOOOO cute! What a wonderful way to start the day! YAY Josie! What a wonderful way to start your day! Melts your heart! Btw, why do you have a poster sized photo of T as a bball star?! awww so cute. 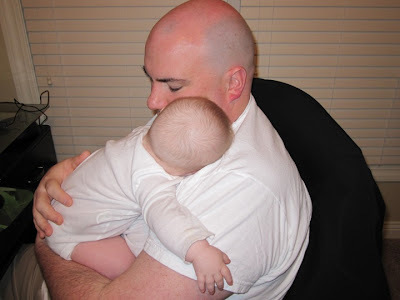 all my kids said dada first too! Well, I pray for your sake that the kid branches out a bit. LC said "da da" (finally) around 10 months old. And it's still the ONLY SOUNDS SHE'S MAKING. I keep telling her speech therapists if there's ONE word she needs to get her WHATEVER she wants, that's the one. Way to GO, Jo! I love that you're so smitten and don't blame you one eensy bit. SO cute! Hearing "Da Da" come out of that gorgeous face would make anyone melt!